I'm lucky to say that I have a great group of friends. As any normal friendship you have ups and downs and times where you are super close and other times that you don't talk for weeks. This is very safe to say for my friends that I've known for many years... some over 20+ years. However, when you have that special bond you can just pick up wherever you last left off. It may be 2 hours ago or 2 months ago since you last spoke, but once you start chatting it's all forgotten. It's just a closeness that you just can't describe. I'm grateful to have these girls in my life. A few weeks back I had a little shingdig for Angela moving to DC and for Angela and Ann's birthday. 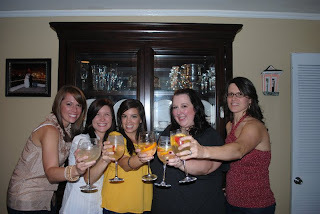 I had a great time just hanging out with the girls chatting away and drinking some yummy concoctions (Jenna makes an awesome white wine sangria, y'all!). It's nice to just sit back and relax with the girls, we should do it more often.